Lift planning using the latest in AutoCAD technology. The latest in mobile crane technology. Lift supervision available 24 hours a day. 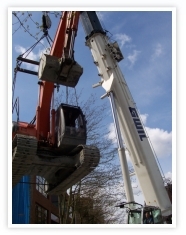 You can feel confident that GWIL Crane Service has the experience, equipment and expertise to safely perform your lift. GWIL has the crane to safely and efficiently get the job done. Our diversified fleet with capacities from 6 to 500 ton, excellent maintenance record and skilled operators ensure that your crane will be on time and ready to work. a quote, please contact us. scan and email to sales@gwilcrane.com. Copyright ©2015 GWIL Industries Inc. All rights reserved.